Hamilton in the House | Skinner Inc.
My daughter is 15 years old, and she is an ardent fan of musical theater. At our house, any possible topic of conversation could (should and will) relate directly to Lin-Manuel Miranda’s Hamilton. Sometimes it’s really a bit of a stretch, but she always comes through with a lyric that fits, and favors us with song. For me, as the head of the book department at Skinner, this is perfect. Although some connect to history effortlessly, many others feel only the distance, compounded by an obligation to memorize sterile dates that memorialize stale moments in the lives of old dead people. But we can close the gap opened up by centuries of time and make direct connections with the past. Miranda accomplishes the task in Hamilton by making historical figures fully relatable in our circa 2016 context. His characters are too real to resist, and audiences shed real tears for the loss of our first Treasury Secretary. Holding, reading, and owning the letters, documents, and books that were composed, written, and published by the real people at the real time has a similarly transporting effect. Many have come to their love of history through this direct connection, and few can turn back. Research begets more research, more documents and books, more stories. Whenever I sit down to read an old letter, I always come up with more questions that send me to new places looking for more. Once I caught Hamilton fever, I saw the material in the October 30 Fine Books & Manuscripts auction in a different light. He was everywhere. 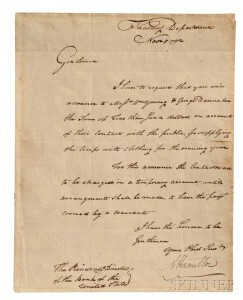 Obvious examples are Lots 86 and 87, two letters written and signed by Hamilton as Secretary of the Treasury. Each of these letters bears his distinctive signature and style, literally and figuratively. Hamilton’s letters are detailed, scrupulous, and unrelenting, to say nothing of his elegant handwriting. 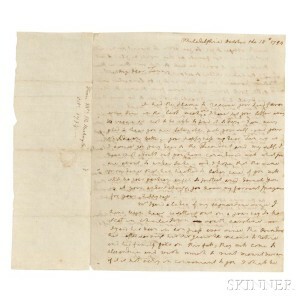 Less obvious is Lot 25, a letter written by Martha Washington on October 18, 1794. Let us find our Hamilton connection. In closing she says, “I have not heard of the President since he left Carlyle.” This letter was written during the Whiskey Rebellion. Washington had just left Philadelphia with Hamilton on September 30th. The two were headed for Carlisle, Pennsylvania, to meet with the fomenters of the Rebellion in order to peaceably resolve the conflict as quickly as possible. There’s more, but in fear of carrying a good thing too far and straying into tedium, I shall leave a list of lot numbers below; anyone interested in continuing the Hamiltonian scavenger hunt may do so with the blessings of the book department and my daughter. We hope you will enjoy reading the descriptions of lots 25, 29, 31, 38, 44, 86, 87, 134, 151, 212, and 327. Read the documents and letters in person at auction previews on October 27 from 12PM-7PM, October 28 from 12PM-5PM, October 29 from 10AM-4PM, and October 30 from 9AM-11AM. This entry was posted in Blog and tagged Alexander Hamilton, boston, fine books auction, Hamilton, historical documents, historical letters, John Quincy Adams, Martha Washington, rare books, rare manuscripts, skinner, skinner auctions by Devon Eastland. Bookmark the permalink.